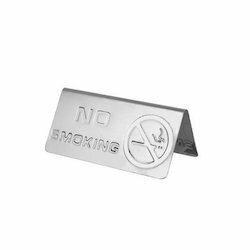 We are a trusted name in the domain of manufacturing, supplying and service-providing of premium quality No Smoking Signage. 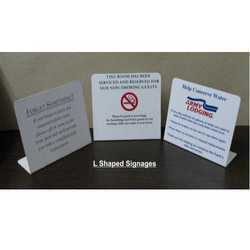 Th signage help in imparting no smoking policies in offices, malls and schools. This signage is manufactured using high quality material and offered to customers in variegated sizes at nominal prices. Features: 3M vinyl with UV resistant or weather proof and non fedable. We are offering No Smoking Signage. We ensure that our products are in compliance with the standards. We provide customized facility, which has according to the exact demands specified by our esteemed clients. We are successfully engaged in providing a wide gamut of No Smoking Sign Board. No Smoking signs offered come in quality constructed finish and find suitability for use in commercial places like hotels, resorts and other similar places.